I love Star Trek. I mean I really love love love it. 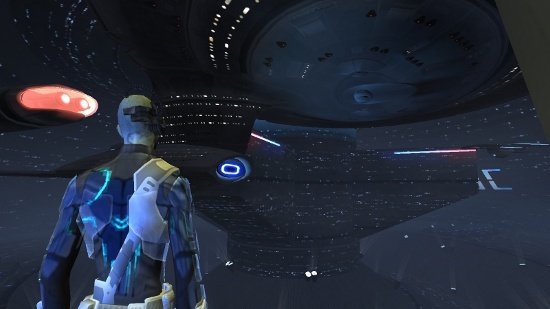 When STO came out, it was going to be my MMORPG, I wanted to fully immerse myself in it. I purchased a lifetime membership precisely so I wouldn’t feel pressured to play all the time, and I measured my engagement with the STO universe into the storyline missions, avoiding defend sector space and exploration missions which are vapid and repetitive. I previously complained about the game’s focus on combat while I prefer exploration and discovery, and learned from reading World of Warcraft forums that this problem is known as the grind. Starship battles can be a grind at times. They are slow and ponderous, which is exactly what I was looking for in this game. 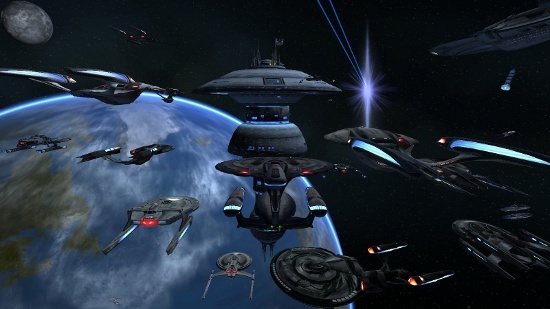 I want every battle to feel like The Wrath of Khan, and STO does a great job with it. The problem is that there are too many starship battles and too little variation between them. I dreaded missions where the goal was to eliminate all enemies from around a planet, where you fly from battle to battle, phasers and torpedoes auto-firing at the same kinds of ships over and over again. I’d have preferred fewer, longer space battles where I would need to concentrate on exploiting an opponent’s failing shields or strategically deal with an enemy ship’s special abilities. 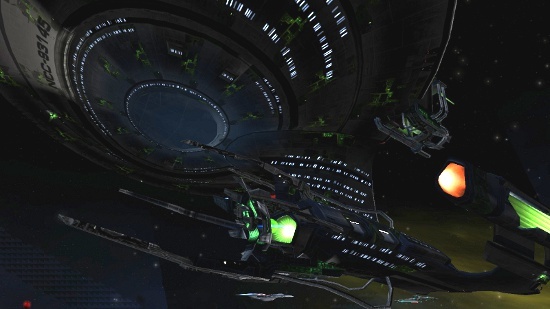 STO space battles can be quite tactical at times, but they can also be repetitive at others. During my two years of playing, ground combat was a total chore. It was also slow and ponderous, with every phaser blast taking off just a tiny bit of an opponent’s shields or life. It got to the point where I would set my away team to fight for me while I read a book or surfed the web. Recently, however, STO has dramatically improved ground combat, making it much more face-paced and interesting. Ground combat is also much more tactical than space combat, which is nice. I enjoy having my engineers set up some mines and turrets and then leading enemies into an ambush; unfortunately, there are still missions where there is just too much combat. Your typical STO mission goes like this: (1) Warp to system X to [investigate, protect, deliver] something. (2) Fly around the [planet, asteroid field] either blasting [badguy ships, badguy stations] or [scanning, repairing, sabotaging] [anomalies, bases, satellites] at four to six different locations. (3) Beam down to the [space station, planet, enemy base]. (4) Run around [blasting badguys, sabotaging stuff, scanning stuff] at four to six different locations. Repeat (2) through (4) as needed until the mission is completed and collect the reward. Deconstructing the action down to this makes it sound extremely tedious, but it depends on the path you take through the game. 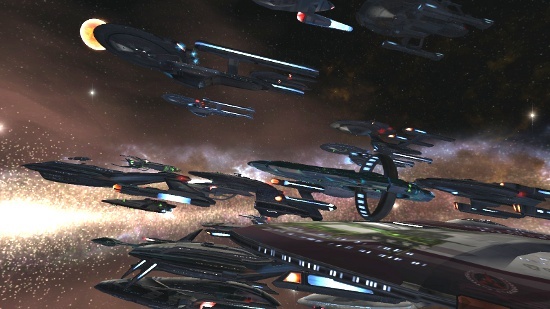 The average STO player takes 50 – 90 hours to peak out at the rank of Vice Admiral. As a casual player, I spread that out over two years. I’ve seen people on the forums get ridiculed for taking more than 100 hours to top-out in the game; after all, if you just focus on exploration missions, you can max out in just 40 hours! The problem is that the exploration missions are also the most generic and boring. You don’t even have to pay much attention as your ship will fire its weapons automatically while you cruise lazy circles in space and your away team can take care of most bad guys while you watch Big Bang Theory episodes. Playing through the game like this is a complete waste of your life. So why bother? STO takes place in the universe Spock left when he failed in his mission to save Romulus from its star going supernova and got wormholed into the Star Trek reboot universe of the 2009 movie. 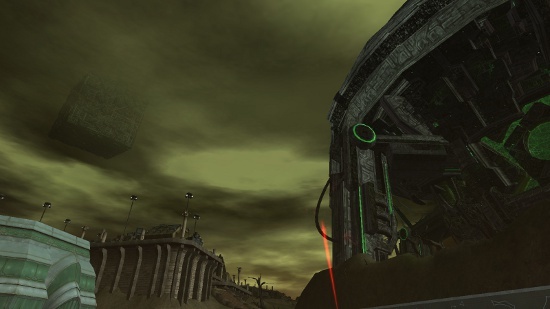 The Romulan Empire is in chaos, the Klingons have declared war, the Gorn are back, and the Borg are invading. The Universe feels dark, intense, and dramatic, and there are some great storylines to play out filled with characters and references that Star Trek fans will appreciate and the technology is more advanced than anything seen in the shows. 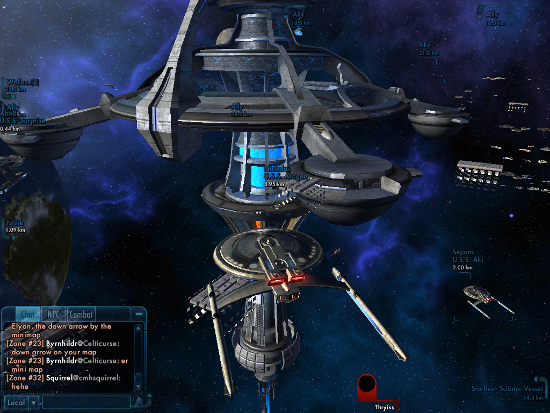 Also working in STO’s favor is that the game is beautiful, and keeps getting more dazzling. I knock the exploration missions, but they make nice filler for discovering fascinating-looking planets. The game is also very large; however, it doesn’t feel as big as it should because of the way the game designers compartmentalized environments (deep space doesn’t flow into planet space, planet space doesn’t flow into ground locations), and you can tour the entire universe in under an hour. With each promotion through the ranks, you get to explore deeper in space with each new area introduced through narration by Leonard Nimoy. 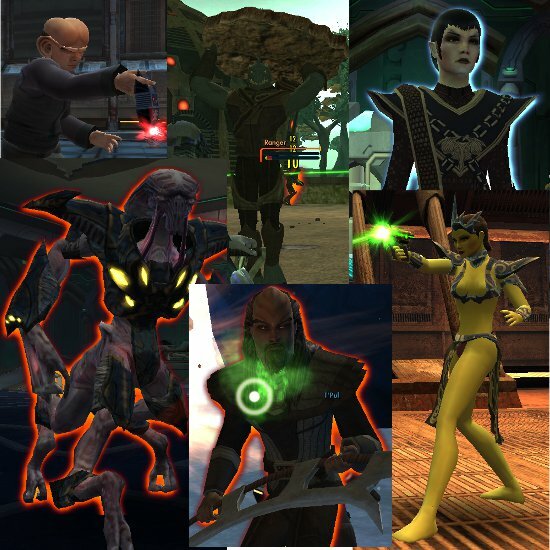 Ferengi, Gorn, Romulans, Undine, Klingons, and Orions, Oh My! Undine, Remans, Romulans, Vulcans, Klingons, Orions, Gorn, Cardasians, Mirror Universe Federation, Hyugen, Devidians, Ferengi, Jem’Hadar, and other aliens infuse STO with variety as well. Just as each of these aliens has their own cultures and strategies in the show, they present different challenges in the game as well. What makes the storyline missions great is meeting recurring villains who get you more invested in the action. 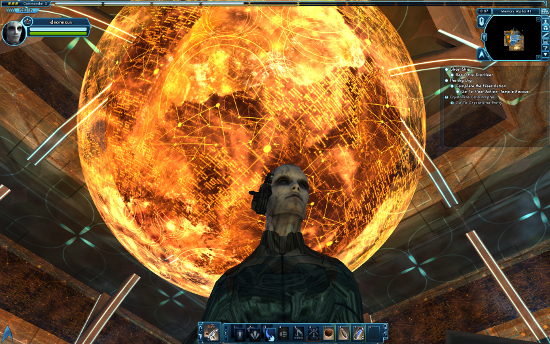 The STO developers have also demonstrated what’s really possible in game with their feature episodes. There are large cities heavily populated with aliens and skies filled with ships , space stations the size of V’ger to fly through, giant monsters, and engaging plots in these extended storylines. With new content always on the way, I really do look forward to each new episode. 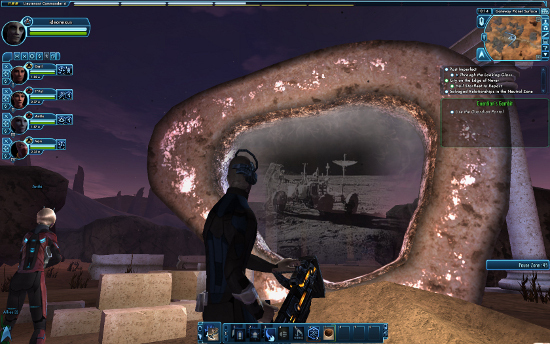 Most importantly however, is the importance of remembering that STO is an MMORPG. The twin M’s in that acronym are the deciding factor in whether the game is a hit or miss, and the Star Trek franchise has the greatest fans on Earth. I loved participating in chats during the game’s first few months, reminiscing about favorite episodes, trading treklore and tips on good in-game episodes and events. There are also Player VS Player (PvP) sessions, which are like team deathmatches with starships and phasers, and the Player VS Environment’s (PvE), which are missions requiring teamwork to complete. But STO has taken the “MM” part of the equation even further with player-authored missions, which is pure genius. The fans are designing missions that are more epic, faster paced, and more creative than anything else in the STO universe and that’s because their doing it out of love. The rewards for these missions are minor, but they are by far more fun than anything else in the game and are keeping me playing. 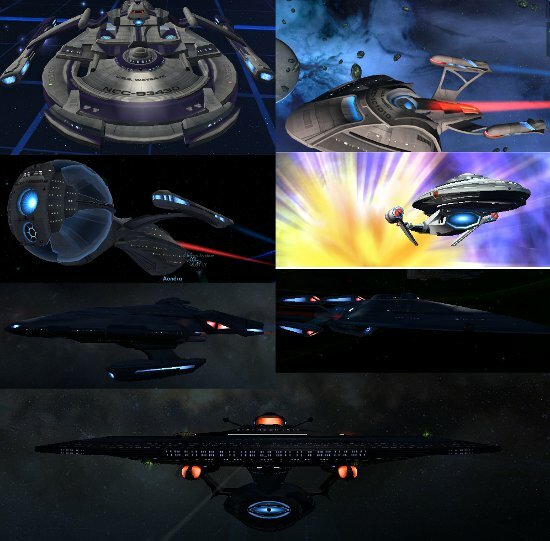 Since STO has gone Free To Play (F2P), with all missions and content available to anyone who downloads it, that doesn’t mean it’s really FREE. There is still a sizable time investment required to play the game and we have to weigh that against other activities on which we could be spending this precious hourglass sand. My conclusion is that it is worth it if you’re a fan and play casually. The gamers who reached Vice Admiral in 40 hours fell prey to the Skinner Box. 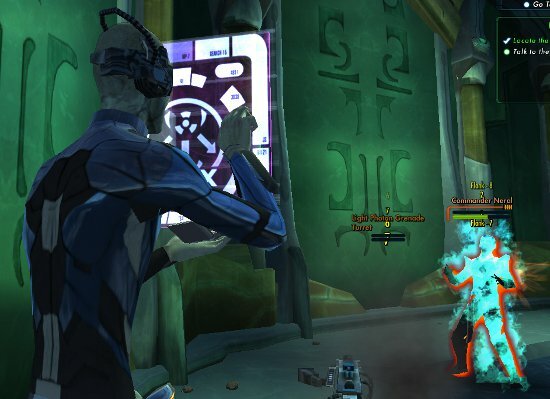 They behaved no better than rats pushing a button to get a reward, and you need to be aware of the animal propensity to fall into this trap if you play STO. I wasn’t fully cognizant of how in-game rewards were tainting my perceptions until I reached Vice Admiral, where experience points are capped and you can no longer increase your skill levels. The ships I earned in STO Waygate, Asimov, Beagle, Sagan, Odyssey, Feynman, and the Enlightenment. As a reward to myself for maxing-out my character, I splurged on the $25 to purchase a Galaxy Dreadnought Starship. My thought was that I would go sightseeing and just appreciate the game play. I visited the planet Vulcan and picked up a detective-style mission to find out who threatened the life of a visiting Romulan dignitary. I ran around the planet, picking up clues for awhile, and realized, Wow, this is really lame. Without the rewards, the mission seemed quite silly. Sure, I was learning interesting stuff about Vulcan and Romulan history, but I was having to run back and forth and all around to pick up each tidbit of trivia. I realized that, without the Skinner Box rewards, I simply didn’t have the patience for most missions and would abandon them once they got tedious. I could jump back in the Skinner Box, I’ve got six character slots left on my account, but that holds no appeal. I could also try playing through the game as a member of the Klingon Empire, but the idea of playing one of those backwards-evolving meatheads is antithesis to what appeals to me about Star Trek. To maintain my enjoyment of the game, I’ve decided to focus on playing it in moderation, which is how I mostly played it through the last two years. It’s like getting a Next Generation box set and only watching a few episodes a week. It’s F2P, so there’s no urgency, just play an episode a week, do a little exploring, adventure with some other players, or try out a fan-fiction episode for some real novelty. It’s a wide, expansive virtual world, and it’s best to savor and appreciate what it gets right. List of all STO Mission. Stick to “storyline” and “episode” content. These missions take longer and give you less rewards for your time, but they are also the most engaging and interesting. Also a filterable list of missions here. 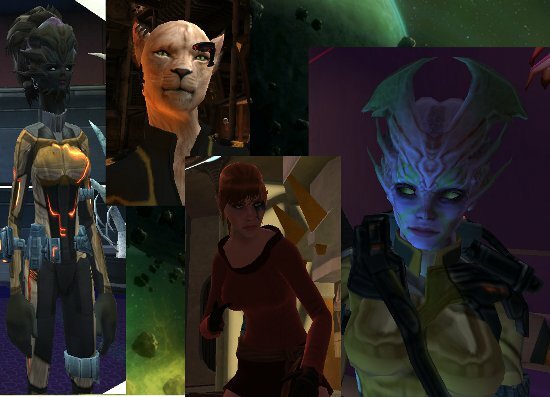 My flickr collection of my adventures in STO. 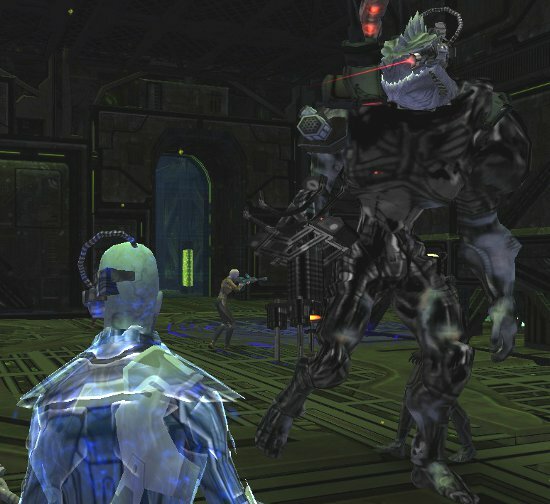 Here’s my original post on STO, complaining about the lack of science in the game. There still isn’t much science in the game.